Astronomers can look back in time to when the Universe was younger. But they don’t have to hop into a time travel machine to do this, like in a sci-fi movie. Instead, all they need are powerful telescopes to look at objects that are far away in the Universe, because when we look at space we are looking at the past! Light is faster than anything else in the Universe, but it still takes time for it to travel through space. For example, it takes 8 minutes for light to travel from the Sun to the Earth. However, the Sun is fairly close to us. For distant objects in the cosmos, like stars or galaxies, it takes millions or even billions of years for their light to reach Earth. So we are actually seeing what these objects looked like millions or billions of years ago! Astronomers look for distant objects in the cosmos because they tell us what the Universe was like when it was much younger. Quasars are special galaxies that are so far away that when we look at them we are looking at the Universe when it was still a baby. They are also incredibly bright – brighter than about 100 normal galaxies combined! It is only because quasars are so bright that astronomers can spot these distant galaxies in telescopes. But they are so far away that they only look like tiny dots of light in photos, so astronomers ask artists to draw what they think quasars look like, like the image shown above. Now, astronomers have found a quasar that is further away than any they have found before. Its light has been travelling to us for nearly 13 billion years! 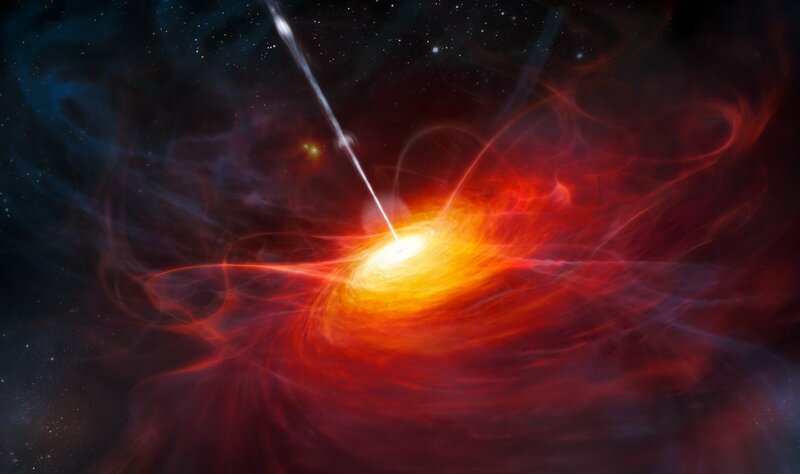 “Finding this object required a painstaking search, but it was worth the effort to be able to unravel some of the mysteries of the early Universe,” says astronomer Daniel Mortlock, a member of the team who discovered this record-breaking quasar. Did you know? When you look up at the night sky, you might be looking at a star that no longer exists! We can still see the star because we are only just getting the light that it sent out a long time ago! This is a kids version of ESO Press Release eso1122.